Working with electricity is dangerous and should always be left to the experts. All work completed by Johnstones Electrical Services is to the highest standard and competitively priced. You can be assured your project is in safe hands with Johnstones Electrical Services, regardless of its size. With over 30 years’ experience Johnstones Electrical Services has an excellent reputation throughout Preston and the surrounding area for delivering a standard of workmanship and customer care second to none. We will provide you with a prompt and reliable service to home-owners in Preston and the surrounding area with a variety of requirements including. Full or partial house re-wires. To ensure your home is safe for you and your family, Johnstones Electrical Services have the knowledge and experience to thoroughly inspect your home, and inform you in layman’s terms the result of the inspection. We realise that the cost of energy can be a drain on your budget, we can offer advice to our customers regarding any devices and monitoring, that will reduce your electricity bills. On the day of our daughter's wedding the electrics fused to the marquee, we called out Mr Johnstone who attended within 20 minutes and had the job done within the hour of us calling him. We were extremely pleased with him and will certainly use him again. I would like to thank Ian Johnstone of Johnstones Electrical Services for the professionalism shown in the work that he did for me concerning a kitchen alteration. This was not a big job but Ian took the time to personally oversee that the work was carried out in a timely fashion and to a high standard. The work undertaken was also priced competitively and fairly. I would have no hesitation in recommending Ian and his company for any future electrical work. Ian at JES added 6 sockets to our kitchen, while the other electricians we got quotes from said they would make a mess and the tiles would break and need to be replaced, Ian came up with a plan and wired the sockets with no damage to the tiles. Its remarkable what he did. 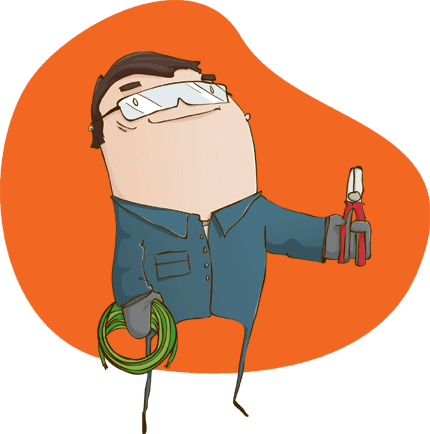 Ian is a first class electrician, who is really sociable and works with a smile on his face. Ian did an excellent couple of jobs for me recently at a very reasonable price. He's reliable and will not overcharge you...No hesitation in recommending him for any electrical jobs.